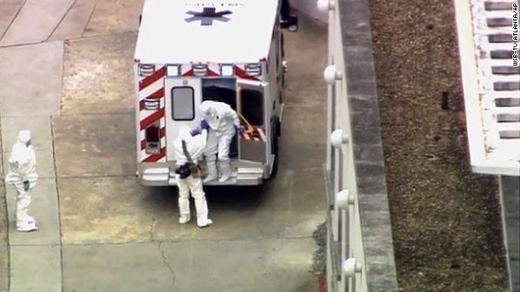 Dr. Kent Brantly, the first Ebola patient to be treated in the United States, arrives at Emory University Hospital on Aug. 2, 2014. An American missionary, he treated patients with Ebola virus disease in Liberia. Photo courtesy of WSB-TV. Physicians, nurses, and staff in Emory's Serious Communicable Diseases Unit (SCDU), located in Emory University Hospital, will participate Thursday in an exercise to test the nationwide ability to move patients with highly infectious diseases safely and securely to regional treatment centers. The SCDU, where four patients with Ebola virus disease were successfully treated in 2014, is now one of the nation's designated Regional Ebola Treatment Centers. This week's exercise is led by the Department of Health and Human Services, with more than 50 organizations participating, including the Department of State, Department of Transportation, Regional Ebola Treatment Centers, local and state emergency management agencies, hospitals, airport authorities, and non-government organizations. Seven people acting as patients with Ebola symptoms will first present themselves at five health care facilities in different regions of the country. Health care workers will collect and ship samples for diagnostic tests to state laboratories, which will practice running tests to diagnose the patients with Ebola virus disease. Using isolation techniques and personal protective equipment, health care workers will place the patients into mobile biocontainment units and transport six of them by air to Regional Ebola Treatment Centers. One pediatric patient will be transported by ground ambulance to Texas Children's Hospital. The patient bound for Emory's SCDU will be transported to DeKalb-Peachtree Airport. Local emergency responders will transfer the patient to a ground ambulance for transportation to Emory University Hospital. After the exercise, participants from all the centers will gather to assess the exercise and share best practices for moving patients with highly infectious diseases.